But silence is not absence. Ashley just returned to Kinshasa after first landing in Kisangani and disbursing the tired teams to their respective homes for a few weeks of much needed rest. 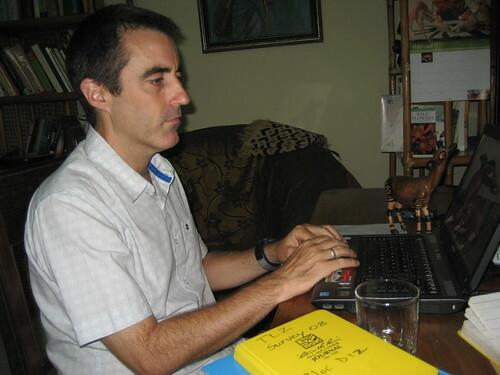 He is now emptying notebooks into the computer so the information can be sent to John who has already started a second step in the analysis. The two will meet in a couple weeks with some other colleagues to work through what the numbers all mean. Is this important? – VERY. How many bonobo are there in the TL2? How many elephant? How many okapi? There is enough information so we can begin to look at these numbers – begin to find out what more is needed – where are the holes, what areas in the TL2 river basins are likely to be most important? And what areas are most threatened by bushmeat hunting. 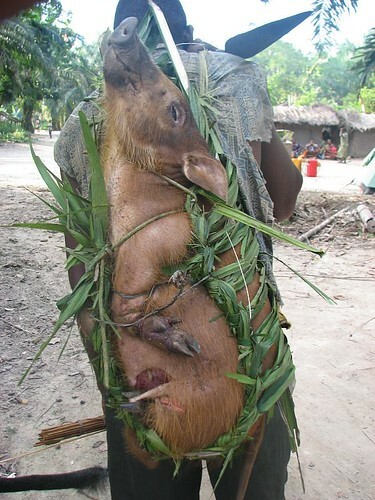 Bringing home a bush pig in Katopa. That’s a lot of meat. 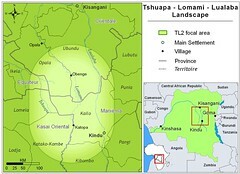 Then back up the Lomami in August for a final marathon push to get the remaining information needed to fill the holes. At the end of the year we will again lay all the information on the table. THEN WHAT? Information is only a first step. Then (and now as well) we have to move towards protection. How do we do that? One thing is certain, to get a protected area that is believed in on the ground and not merely a piece of paper in a distant capital city means we need a lot of support and at all levels — we will need a lot of people pushing with us. This entry was written by Terese Hart, posted on 2008-07-07 at 6:42 pm, filed under About the project. Bookmark the permalink. Follow any comments here with the RSS feed for this post. Post a comment or leave a trackback: Trackback URL. Good to hear from y’all again. Looking forward to learning about the next steps and what, if anything, we can do from out here. I think we all look forward immensely to seeing what comes out of all the data-crunching! We too are “looking forward” more than ever before…even though my next few posts will be “looking back”, taking stock of what we really have learned in the past few months. But in the meantime Ashely and John are preparing data for an “analysis session” at the end of this month. We will see what comes from it! !